As far as we’re concerned a dog that doesn't know the taste of beef stew is like a dog that doesn't know the taste of tennis ball. That's why we made this meal of slow cooked meaty chunks and potatoes just for them. 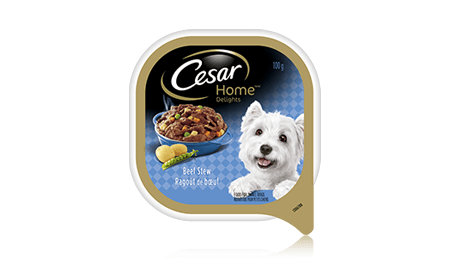 CESAR® HOME DELIGHTS® BEEF STEW 100g is rated 4.0 out of 5 by 1. Rated 4 out of 5 by Sassie from Must Taste Good We just brought Sassie home. She is rescue dog and loves this flavour! CESAR® HOME DELIGHTS™ Beef Stew is formulated to meet the Nutritional levels established by the AAFCO Dog Food Nutrient Profiles for maintenance. CHICKEN, BEEF, LIVER, MEAT BY-PRODUCT, POTATOES, STARCH, WHEAT GLUTEN, MINERALS, CARROTS, PEAS, PEA FIBRE, SALT, WHEAT FLOUR, SODIUM TRIPOLYPHOSPHATE, VITAMINS, COLOUR, NATURAL FLAVOUR, XANTHAN GUM, GUAR GUM, SUFFICIENT WATER FOR PROCESSING.